As you know, Mail Server tutorials are all over the internet. So if you stumbled upon mine, then you were like me trying to assemble one based on how others do it to save reading the manual. A mail server is NOT a walk through the park like some other servers are (such as Web, Database, etc). They can be very complicated to master; and frankly, when you’re short on time, it’s easier to just get one going right away. Don’t dismiss the need to learn how it works once you’ve set it up otherwise you may not know how to recover from a unexpected situation. But instead, learn about how it works (and how to further tweak it) after the deadlines have been met. Besides, your boss will be impressed when you show him your successful results sooner then later. You’re looking for an automated solution to installing a mail server with little effort because you’re on a tight deadline. A Database Backend (PostgreSQL) giving you central configuration. This tutorial focuses on version 8.4 because that is what ships with CentOS and Red Hat. But most (if not all) of this tutorial should still work fine if you choose to use version 9.x of the database instead. Spam Control (SpamAssasin v3.3.x, Amavisd-new v2.8, and Clam AntiVirus v0.98) gives you some spam and anti-virus control. I’ve been looking into DSPAM but haven’t implemented it yet. I figure I’ll make a part 2 to this blog once i get around to working with it and mastering it’s setup. Dovecot Pigeonhole v2.0.x provides you a way of routing mail in the users inbox based on it’s content. You can key off of certain content within a received message and mark it as spam, or flag it as important because it was sent by a certain individual, etc. It basically gives you the ability to custom some of the post processing of a received message that passed through all the other checks (spam, anti-virus, etc). Administrative Delegation: Grant enough privileges to another administrator who only has rights to his/her domain you granted them access to. Please note the application versions identified above as this tutorial focuses specifically on only them. One big issue I found while researching how to set up a mail server was that the other tutorials I found didn’t really mention the software versions they were using. Hence, when I stumbled upon these old article(s) with new(er) software, it made for quite a painful experience when things didn’t work. postfix as shipped with CentOS and in the EPEL repository is not compiled with PostgreSQL support. I had to recompile this package as well just to enable this extra database support. postfixadmin in the EPEL repository has qwirks I wasn’t happy with. I needed to fix a php error that kept coming up. I needed to adjust the database schema and permissions as well as fixing the Vacation Notification feature. I also did not want the mandatory MySQL dependency; so I removed that too. This blog itself was a massive hurdle. There are just so many configuration files and important points to account for that I found it easier to package my own rpm (nuxref-templates-mxserver) containing a series of configuration templates. The templates themselves took a while to construct in such a way that they could all be used together. The following seven steps below will get you up and running. # your version of postfix (but this time with PostgreSQL support). To simplify your life, I’ve made the configuration of all the steps below reference a few global variables. The ones identified below are the only ones you’ll probably want to change. May I suggest you paste the below information in your favorite text editor (vi, emacs, etc) and adjust the variables to how you want them making it easier to paste them back to your terminal screen. #       following this blog, you'll be able to create it! Once all of this has been set you can proceed to do any of the below steps! Keep in mind that if you decide to change any of the variables above, you may need to redo every single step identified below. echo "Enter the role password of '$PGROPASS' when prompted"
# can just be automatic). Now you can setup NginX to host your administration; in the below example, I set up https://postfixadmin.<your.domain>/ to go to the postfixadmin page. Once you’re complete that, you’re now ready to access the administrator interface and set up a new account. Simply visit https://postfixadmin.<your.domain>/setup.php. The templates I provided will set the system password to admin. You’ll need to always enter this value prior to creating an account below. Once you’re done creating an account, just change the setup.php script to read-only as a security precaution. You can preform every other action you’ll ever need using the account you already created. You can simply access https://postfixadmin.<your.domain>/ now (without the setup.php) and login using the new administrator you created. echo "Enter the role password of '$PGRQPASS' when prompted"
You can simply access https://roundcube.<your.domain>/ now and access any mailboxes you configured. Just remember to tell your users that they must specify their full email address as their username. Each mailbox you create using PostfixAdmin you’ll be able to access with your Roundcube webpage. If you aren’t familiar with Fail2Ban; now would be an excellent time to learn about it. I wrote a blog about securing your CentOS system a while back and encourage you to read it. At the very least, read the section on Fail2Ban. The below explains how you can protect yourself from brute force. This mail server (ideally) must be accessible to the internet via a static IP address. This means that if you’re hosting this at home, the IP address your ISP provides you may not work (Dynamic IP vs Static IP). That said; a lot of ISPs can offer you a static IP if you don’t already have one for little (to no) extra cost. Your own domain name (if you don’t have an official one already) because you can’t have an email@your.domain.com if your.domain.com isn’t publicly recognized. 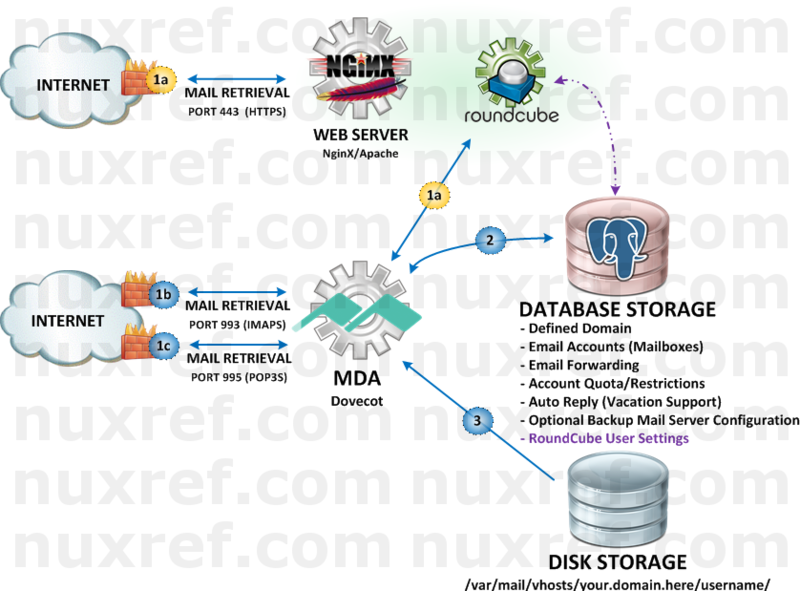 A Mail Exchange (MX) Record that points to your new mail server by via it’s accessible IP on the internet. This is the only way the outside world will be able to send mail back to you; this step is not required if the only thing you’re doing is sending email out. Most Domain Registars allow you to set your own MX record (GoDaddy.com, NameCheap.com) which can simply be entered right from their webpage with little to no effort. If you’re paying someone else to host your websites for the domain you own, then most likely they have the MX record already pointing to them. You may need to open a support ticket (or call them) and tell them you want the MX record changed to point back to your own server instead or forward it. Don’t allow your mail server to relay mail from untrusted sources. Hence; make sure you only allow users you create accounts for to send mail from your server. Throttle all outbound mail delivery to each of their relay locations. With respect to the first point, even if you have to send massive amounts of mail from your system on a regular basis, do it in small batches. This way you won’t overwhelm the remote servers accepting your mail you want delivered. If you followed my blog and are using the settings I put in place, then you’re already configured for the last 2 options above. The first option is governed by your own decisions. 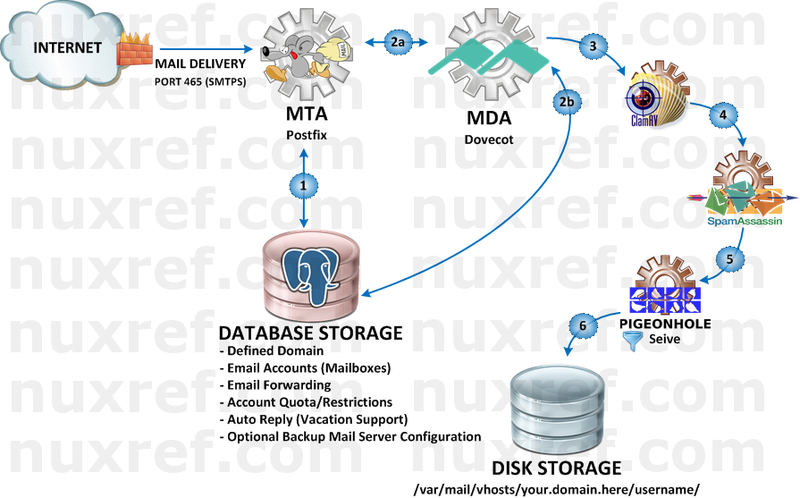 Your PostgreSQL Database: This is where all of your mail configuration is for both your MTA and MDA. You definitely do not want to lose this. May I suggest you reference my other blog entry here where I wrote a really simple backup/restore tool for a PostgreSQL database. /etc/postfixadmin/*: Your Postfix Admin flat file configuration allowing you to centrally manage everything via a webpage. /etc/postfix/*: Your Postfix flat file configuration which defines the core of your MTA. It’s configuration allows you to centrally manage everything else through the Postfix Administration website. /etc/roundcube/*: Your Roundcube flat file configuration which allowing users to check their mail via a webpage you host. /etc/dovecot/*: Your Dovecot flat file configuration which defines the core of your MDA. It’s configuration allows you to centrally manage everything through the Postfix Administration website. /var/mail/vhosts/*: All of your user’s mailboxes are defined here. This is a vast storage of unread and read mail that resides on your server. This information was based on a great blog entry on securing your NginX configuration found here. Apache is a perfectly fine alternative solution as well! I simply chose NginX because it is much more lightweight approach. In fact, PostfixAdmin and RoundCube mail already come with Apache configuration out of the box located in /etc/httpd/conf.d/. Thus, if you simply start up your Apache instance (service httpd start), you will be hosting its services right away. Please keep in mind that the default (Apache) configuration does not come with all the SSL and added security I provided with the NginX templates. Perhaps later on, I will update the template rpm to include an Apache secure setup as well. This blog took me a very (,very) long time to put together and test! The repository hosting alone now accommodates all my blog entries up to this date. If you like what you see and wish to copy and paste this HOWTO, please reference back to this blog post at the very least. It’s really all I ask. This blog required me to set up my own repository of which I was thinking that some people might want me to continue to maintain. Such as fetching and applying the latest security updates after testing them first for the continued promise of stability. Personally, I believe I may be setting up a new can of worms for myself by offering this service because bandwidth costs money and updates cost time. But I’ll share it publicly and see how things go anyway. If you’d like me to continue to monitor and apply updates as well as hosting the repository for long terms, please consider donating or offering a mirror server to help me out! This would would be greatly appreciated! This blog could not have been made possible without the tons of resources that I used. Some of these resources including other peoples blogs too which I picked and chose approaches they took. DNSB: Spam Database Lookup. Use this site if you think your domain is blacklisted. Spam Assassin: Reduce (if not completel eliminate) unsolicited comercial email (SPAM) from your incoming email. Strong SSL Security on NginX: A great blog entry on web server security! This entry was posted in Linux HOWTO and tagged Centos, ClamAV, Database, Dovecot, Email, Email Accounts, Email Forwarding, Fail2Ban, IMAP, IMAPS, IPTables, Mail, Mailbox, MDA, MTA, Pigeonhole, POP3, POP3S, Postfix, Postfix Admin, PostgreSQL, Red Hat, RHEL, RoundCube, Sieve, SMTP, SMTPS, Spam Assassin, Virtual Domains on April 22, 2014 by l2g. As a Developer or even a System Administrator, experiencing database corruption is a scary thing. Usually when something you’re responsible fails… it fails hard. It’s important to always make frequent backups of your database(s) your in charge of. The internet is filled with solutions and one liners you can consider. But there is a lot of contradiction everywhere too as each site tells you how it should be done. Personally, I’m not going to tell you the way I do it is the correct way or not. But I will tell you it works, and it’s saved me in numerous occasions. I’m lazy, and when I look for solutions online, I always hope someone is just going to spell it right out for me. It’s so much easier when someone else does all the work; but usually that’s wasn’t the case for me. Stack Overflow is fantastic for getting the quick 1 liners you need to build your solution, but I prefer automation. I don’t want to remember all of the different options one tool has from another. I want simplicity because when something fails, I don’t want to learn the complicated steps to do a database restoration. As a strong supporter of PostgreSQL, I want to provide the solution I use to hopefully speed along someone else’s research in the future. I can’t stress enough also that if you aren’t taking regular backups of databases you are responsible for, then you really should reconsider and at use the scripts defined below. These RPMs can also be fetch from my nuxref repository. The rest of this blog contains a simplified version of the content found in the attached RPMs but should still suit the needs of most! #       databases hosted by the postgresql instance are used. # 9 where a setting of 0 is used to disable it. echo "Error: You must be 'root' to use this script." # all of the databases hosted by the PostgreSQL instance. [ ! -z "$@" ] && DBLIST="$@"
echo -n "$(date +'%Y-%m-%d %H:%M:%S') - $$ - ERROR - "
echo "Failed to dump system globals; backup aborted." # this file if need be. echo -n "$(date +'%Y-%m-%d %H:%M:%S') - $$ - INFO - "
echo "Dumping database '$DBNAME' ..."
PGFLAGS="-p $PGPORT -h $PGHOST --create --oids --format=t --verbose"
Backups are one thing, but the ability to restore is another. This script pairs with the above and will allow you to restore different points in time. #       databases in question you are trying to restore. echo "Directory '$DUMPDIR' does not exist." echo -n $"Restoring Database Globals ..."
$PGENGINE/psql -a -p $PGPORT -h $PGHOST"
echo $"Uncompressing Database $DBNAME ($SNAPTIME)..."
echo $"Restoring Database $DBNAME ($SNAPTIME)..."
#     are restoring it anyway. #     being restored or you will have strange results. -C -d template1 -h $PGHOST $PGBKUP"
echo "Warning: $DBNAME ($SNAPTIME) was not correctly restored." echo -n "$(date +'%Y-%m-%d %H:%M:%S') - $$ - WARNING - "
echo $"There were no databases restored." printf "    %-16s %sn" "TIMESTAMP" "DATABASE(S)"
# Call the script with no parameters, to see a nice list of the last 10 backups. #          system globals to get reloaded as well. # the snapshot time (in case you want your restore to be specific). # of the time so long as you provide YYYYMMDDHHmmss in that format. If worst case scenario happens, and the restore process seems to be failing you, your not out of options. As long as you’ve been taking frequent backups, there is always a way back! Remember that restores will fail if the database is being accessed by someone else. The below is a dirty little scripted trick that boots everyone accessing your system off. It’s somewhat dangerous to do, but if restoring is your final goal, then the danger is mitigated. # handle and attempt to kick them by sending each of them a SIGTERM. # is the absolute 'WORST' thing you can do. From a system that is experiencing harddrive failures. From another processes accessing /var/lib/pgsql/data/* that shouldn’t be. Only the database itself should be modifying/accessing the contents of this directory unless you know what you’re doing. From just a simple power outage. A busy system that isn’t backed up by a UPS device or redundant power sources can have it’s file system corrupted easily during a loss of power. What usually happens is PostgreSQL is writing content to the database when the power is pulled from the machine. At the end of the day, you’re left with a database that wasn’t correctly written to and in some cases can be seriously damaged from this as a result. In some cases, the corruption can be so bad the database instance (PostgreSQL) won’t even start. Evidently, you can’t restore a working copy of a database if the service itself isn’t working for you. Sometimes attempting to repair the write-ahead logging can help you recover. Obviously this completely depends on the type of failure you’re experiencing. /var/lib/pgsql/data/pg_xlog/* can help shed some light on this subject as well. The below script assumes your instance of PostgreSQL is stopped. $SU -l postgres -c "$PGENGINE/pg_resetxlog -f $PGDATA"
I can not be held responsible or liable for anything that goes wrong with your system. This blog is intended to be used as a resource only and will hopefully help you out in the time of need. These tools work for me and have been tested thoroughly using PostgreSQL v8.4 (which ships with CentOS 6.x). I have not tried any of these tools for PostgreSQL v9.x or higher and can not promise you anything, but I honestly can’t see a reason why they wouldn’t work. This entry was posted in Linux HOWTO and tagged Backup, Centos, Database, PostgreSQL, Recovery, Red Hat, Restore, RHEL on March 13, 2014 by l2g.